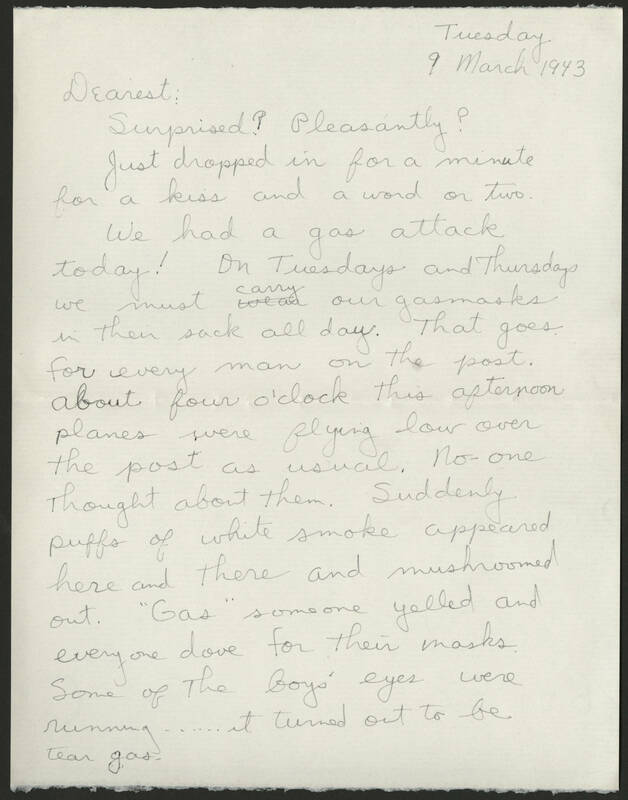 Tuesday 9 March 1943 Dearest: Surprised? Pleasantly? Just dropped in for a minute for a kiss and a word or two. We had a gas attack today! On Tuesdays and Thursdays we must carry our gasmasks in their sack all day. That goes for every man on the post. About four o'clock this afternoon planes were flying low over the post as usual. No one thought about them. Suddenly puffs of white smoke appeared here and there and mushroomed out. "Gas" someone yelled and everyone dove for their masks. Some of the boys' eyes were running...... it turned out to be tear gas.